DID I MENTION GAMES YET?! Flash drawings of Canon Ponies. Past present future. Wandering in Ponyville: Lost little filly - OPEN. Embermane rubbed her eyes and yawned. She was very tired from all the walking she had done. She listened sleepily to the others as they tried to figure out where she was going to stay, Personally, as she'd been on the road for about a fort-night, she was perfectly well placed to just laydown where she was and doze, as she had been doing for that long. she ticked her hooves under her smell frame as she sat down on the dewy grass outside of the small town. 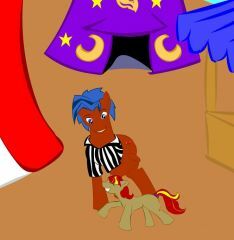 embermane felt, strangely safe actually, now that her 'cutie-mark tantrum' was over that is. She settled down and just listened lazily untill she was nearly asleep. Ember's ears drooped yet again, as she looked at the pegasi. "My..." She didn't really feel the need to lie at this time, because she was so very far from home. "... My auntie told me that my mum and dad would hate me if I didn't get a Cutie mark... so I have to get one!" She cried. "I have to get one because my auntie said so! she can see everypony's future." Ember sniffled again. -A long ways away, a gypsy Zebra in a circus sneezes. Ember's ears drooped again. "I didn't know what was on the other side... I walked through it... " She got up on her very muddy hooves and looked around, again she was being ignored. Well, that's alright she thought, it was because she didn't have a cutie mark, and her flank was very bare. She knew this, because her aunt had told her this would happen... Ember didn't know that her 'dear old aunt' had been lieing to her... "I wanna go home..." Ember sniffled miserably. She knew this was not a thing that could happen, but she so longed to see her mother again. She started to walk back toward the forest slowly, while the others were talking amung themselves. She didn't want to be a burdon on anyone but there was the fact that she could not go home yet. "...but... I can't. 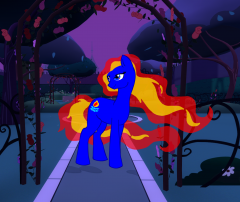 Not untill I get my Cutie mark..."
Ember just hung her head. She didn't want anyone to care for her but at the same time she didn't want to be on her own. She sniffled a few more times and thought about what her aunt had said. 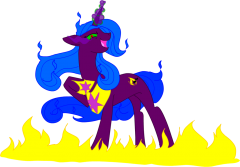 she perked up a bit and said to everypony around her. 'How... How do you get a cutie mark?" She was desperate to go home, as she missed her mother quite dearly, but the thought of her mother and father hateing her was the, worst. Possible. Thing. Ever. she stared around at the croud who seemed to be ignoreing her as she was very small and they were all talking amungst themselves. Ember's face grew hot, she had a talent for changeing her moods in the blink of an eye, She raised her voice and practically yelled. "HOW DO I GET A CUTIE MARRRRK!!?" Embermane sniffled as the griffion put her down, and tried not to run, not like she had any place to go that is... She sat back on her rump, that was quite bare, and flushed a bit as her stomach gave an unearthly growl. Ember hung her head, it had been a whole day since she had stopped to eat those weird flowers in the forest. Ember looked up at the others when she was was asked something, and her face fell again. "n-no one misses... me" She hiccupped. She knew her aunt would never lie to her... "They... hate me..." She whined then as her head drooped lower. she was in trouble, she knew it. She didn't have to have a cutie mark to know this either, Her aunt had predicted it actually, just before she'd run away from home. She remembered the words her aunt had spoken, and the look in her mother's eyes that night as well, and she had ran. And ran. And ran, untill she could run no longer. Ember was so frightened by the large and imposing looking beast with a long beak that she could not even speak when addressed. Her ears lay flat against her head and she shook all over in the griffin's claws. She had no idea what was going to happen, and yet still had no concept of anything past the 'now' and 'now' she was just too scared to think about anything elce. Her mouth gaped as she looked wide eyed at the mighty creature before her. Ember was stareing so intently that she never even noticed that she was in the air. On the ground, the great manticore which was actually only a small baby manticore and not fullgrown, lept up in fright at the lightning and turned tail to run the other way back to it's home, at the edge of the forest it whined and looked back. it had only wanted to play with the small little thing, maybe bat it around a bit... stupid... mean... pony.